Each month we publish a newsletter titled IAQ Website of the Month. The excerpt below was originally published in the February 2014 newsletter. Sometimes I feel sorry for dust mites. How would you like it if your picture was used to sell vacuums, filters and carpet cleaning services? Does vacuuming and air cleaning even control dust mites? This month’s featured website is an authoritative resource for all things related to environmental allergens. The site is called Allergy Practice Parameters and comes from a joint task force of AAAAI & ACAAI. The joint task force develops Practice Parameters, which are to be used by practicing physicians. It can be time consuming to wade through all the new research and marketing propaganda to figure out the current state of the art. The practice parameters act as a collective review of relevant and evidence-based information. I recommend you read the whole practice parameter to get the full context of these sound bites. Each month we publish a newsletter titled IAQ Website of the Month. The excerpt below was originally published in the April 2010 newsletter. As I sat down to write this newsletter, I unleashed an impressive string of 5 consecutive sneezes. We’re in the allergy season now, so this month I’m featuring a resource to help you better understand allergies and asthma. Allergen avoidance in asthma: What do we do now? AAAAI also recently published the “2010 Primer on Allergic and Immunologic Disease”. This free, online book includes 30 chapters that review the field’s current research and understanding. Most of the primer was above my head, but chapter 13 “Environmental and Occupational Allergies” is a great summary of what every IAQ professional should know about allergies and asthma. To access Chapter 13, click HERE. To find articles, you can either type in search terms on the journal’s homepage, or browse the table of contents from previous issues. When you find an article you like from 2008 or prior, you can read the full text online or download a pdf file to your computer. To visit this month’s featured website, click: Journal of Allergy and Clinical Immunology. When travelling this week, I was reading the latest Indoor Air journal and there were two interesting articles that both studied the relationship between mold and dust mites. Although the article doesn’t address setting acceptable exposure levels for humans, the article shows the dose response figures for mice based on several health outcomes. The second article I read that addressed mold and dust mites was A dose-dependent relationship between the severity of visible mold growth and IgE levels of pre-school-aged resident children in Taiwan _2. I found this to be a fascinating article that wonderfully illustrates the point that it’s not exclusively mold that causes health effects in damp environments. The study found a statistically significant dose-dependent relationship between severity of indoor visible mold growth and total serum antibody (IgE) levels. So far, so good. But when they looked at the specific type of antibodies (as opposed to the total), they didn’t find a correlation with fungal allergens. They did however, find that dust mite antibodies corresponded with the indoor visible mold growth. So what was going on? The authors suspect that the degree of visible mold growth is an indicator of dampness. The mold itself may not be affecting the children’s health, but the dampness leads to elevated concentrations of other exposures, such as dust mite colonies, that do affect health. They recommend that studies done on the health effects of mold should control for these other exposures. 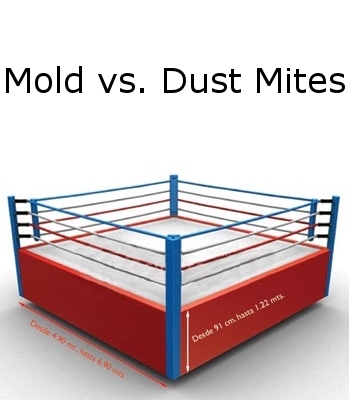 So to sum up, the first study found that a common type of mold was a more potent allergen than dust mites. The second study found dust mites to be causing greater allergic responses than mold. How can we explain the difference in these conclusions? 2. The first study exposed mice to equal amounts of Penicillium chrysogenum allergen and dust mite allergen. But in a typical home, are there really an equal amount? We can say that Penicillium chrysogenum is more potent gram for gram, but exposure to dust mite allergen may be several orders of magnitude greater. 3. In the second study, although total IgE antibodies were more closely correlated to dust mites, they could not establish solid statistical significance. Also, they didn’t control for many other common indoor allergens like cockroach, which can be found in damp indoor environments. Do these studies have anything in common? Yes! They share the conviction that exposures to contaminants found in damp buildings can illicit a measurable affect on health. That is a powerful message.